When you decide to get into Ecommerce website investing and start searching for websites, you’ll notice that there are not only different industries to invest in but also different business models. You might be aware of some of these different models, such as High Ticket Dropshipping, Fulfilled By Amazon (FBA), Software As A Service (SAAS), and others. In addition to understanding a certain niche in the market, you also need to understand the business model of the website you are investing in. Today we share some key factors to consider as you think about different online business models. Factors like resale value, the number of available websites, and dollar margins will all affect the amount of time you put in and the financial decisions you will have to make. Having an evaluative framework in place will make this sorting process much easier. If you’re looking for an evaluative framework to inform your Ecommerce investment decisions, then this is one episode you won’t want to miss. Welcome to the Professional Website Investor Podcast, the show where we talk about what it takes to successfully buy, operate, scale and sell a thriving eCommerce business. When it comes to doing business online, we believe that buying an existing website is far superior to building one from scratch. If you’re a career professional who’s looking to become an eCommerce store owner, listening to this show will give you the knowledge, tools and community support you need to be successful. I’m your host, Ryan Cowden. This week, we’re joined by Ian Bond from professionalwebsiteinvestors.com. 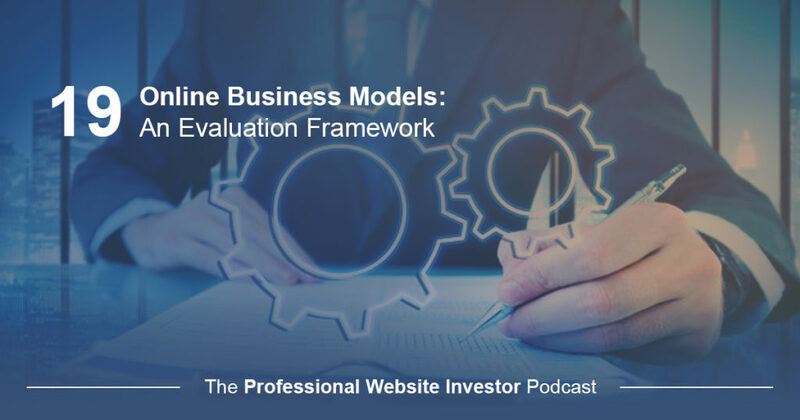 In this episode of the Professional Website Investor Podcast, Ian and I discuss a common framework you can use to elevate your online business models. When you decide to get into eCommerce website investing and start searching for websites, you’ll notice that there are not only different industries to invest in but also different business models. You might be aware of some of these different models already such as high ticket, drop shipping, fulfilled by Amazon, software as a service and others. In addition to understanding a certain niche in the market, you also need to understand the business model of the website you are investing in. Today we share some key factors to consider as you look at different online business models, factors like resale value, the number of available websites and dollar margins will all affect the amount of time you put in and the financial decisions you’ll have to make. Having an evaluative framework in place will make this sorting process much easier. On this episode, you’ll hear Ian Bond’s evaluative framework, a pyramid of factors and his description of each level of the pyramid. The first factor at the base of the pyramid is the number of sites available. You can’t buy something that doesn’t exist, so the more choices you have, the better off you’ll be. The second factor is the special knowledge requirement. Some business models require a lot of content specific knowledge that will impact your ability to effectively operate and meet your customer’s needs. The third factor is required customer support. Some models have high levels of customer support and some have relatively low levels. The fourth factor, the middle of the pyramid, is ease of scalability. On one extreme, some models are easy to scale throughout sourcing while other models require you to scale it up on your own. Make sure you know how to scale your business before you invest in it. The fifth factor is dollar margins. Some models make small margins on lots of transactions while other models make high margins on fewer transactions, which all affects how you market and operate your business. The sixth factor is the traffic needed. High traffic sites tend to produce lower dollar margins while lower traffic sites tend to produce higher margins. Again, this factor will determine how you spend your time and the amount of customers that you’ll need. The seventh factor, sitting atop of the pyramid, is resale value. Some websites focus on single products and chase trends leading to a lower resale value, while others focus on long-term business interests and have the potential for higher resale value. If you’re looking for an evaluative framework to inform your eCommerce investment decisions, this is one episode you won’t want to miss. There’s a lot of actionable advice in this episode, so grab something to write with because you’re going to want to take notes. As always, I’ll be back on the other side to wrap up any loose ends. Without any further ado, here’s my conversation with Ian Bond. All right, Ian, welcome back to the show. It’s great to see you. Welcome back. Ryan, it’s great to be back. We’ve got an exciting lineup today. Most people might imagine we’re going to talk about … We’re going to have more than one recording episode, and today it’s particularly timely because we’re going to talk about these are very linked together, so I’m excited. It’s very interesting. I was thinking about this. Last week, I was actually invited to a very small get together in my day job, and the speaker was Ray Dalio who is a legendary investor and the founder of Bridgewater Associates. Ray talked about his over 40 years’ investing, wrote a book called Principles, and he has a framework on how he looks at investing. He actually has written down why he made investments at certain time based on these principles. He’s honed the principles over time. I can’t tell you that this is Ray Dalio-esque, but my journey in the eCommerce world started about five years ago. Over time, I have I think tried to put a framework around how I think of things. Certainly, what we’re going to talk about today is not all inclusive. I think it does tease out things that are important and also highlights areas where things are more obvious that you also have to think about. Let’s just call this principles one for me and I want to give at least people a perspective of early on, over the last five years, in the first year and a half I wasn’t an investor, and now we’ve purchased over a dozen sites in the last three and a half years. These are things that I’ve worked through and iterated through that time period. Great. Today, on today’s episode, I think it’s fair to say that we’re not evaluating the specific business models in this episode. What we’re going to be evaluating are the different factors that you used. Ryan, we’ve created an infographic where you can go to professionalwebsiteinvestors.com and the infographic has a pyramid. On the pyramid, there are a number of the factors we’re going to discuss, which are the drivers of the decision-making process for selecting an online business model. This comes from my perspective as a career executive, a career professional corporate executive. At the time of my first purchase, 58 years old. That’s my bias. Someone who brings a different background, different skillset. You can certainly feel free to disagree and has right to disagree. This is a thought starter, but you can go and download the infographic and use it. Some of the other comments we’ll make where we’ll tease out some other factors that aren’t on the infographic will also be things you consider then. In addition to the framework, then there are six business models that we actually go through and rank, which will be the subject of our next podcast. Great. I thought we can start at the bottom of the pyramid and work our way up. The base foundation level of the pyramid is number of websites available to buy. It may sound obvious, but website investing is a bit of a continuum. People think of it as a bit of a continuum, but you actually have discrete choices. On the one hand, you can’t buy things that don’t exist. If you’re looking for a needle in a haystack, you’re never going to get in the game. The other I think relevant point that I would make about this is I think most people get this backwards. They become enamored with a type of website, but they don’t actually understand the problem that they’re solving or maybe what it takes to actually execute that business model. I think you have to really start at what problem you’re solving and how you go about solving that in order to really be looking at appropriate business sites. I’ll just throw out an example. Early on, I was very enamored with content sites. They work while you sleep, and they’re intellectually very appealing, but I realized after meeting people that were really SEO ninjas, search engine optimization ninjas, and I just didn’t have that passion. I wasn’t going to sit around and look at keyword strategies or look at PBN strategies. It’s not in my nature. When I met people that did that for a living, it had validated it, and I was glad I really didn’t go down that line. Two things. You can’t buy things that don’t exist in. Secondly, think about the problem and what it’s going to take to solve it before you actually go too far and spend too much time looking at any specific business model. Great. When you’re looking at these business models, are you saying that it’s good to get into a model where the quantity of sites available is high? Is that what you’re saying? Well, yeah, there’s no question that the more choices that you have, the better off you’ll be. The top several business models will give you plenty of choices. It’s more of like I say, a word of caution, especially for the beginner to understand that I’ve written about and I’ve mentioned on this podcast how I think of things from a corporate strategy standpoint in the terms of an activity chain. It’s those activities that drive value, and it’s those activities that you’ll need to do to succeed. The activities are going to drive how you succeed, but it’s also going to be what you’re required to do. If you don’t like doing those things, you shouldn’t try to opt into a business model where you’re either not interested or really don’t like it. The second level of the pyramid is special knowledge required. Are you looking at that in referring to the business model itself or the product on the website? What do you mean by special knowledge? I think in this, and I’ll go back to the SEO example, that’s one area where content sites can require SEO knowledge. A SaaS site is going to require some technology knowledge. If you were to buy a service business, you would clearly have to be deeply immersed in whatever the service is that you’re going to be delivering. My greatest fear, and I’ve mentioned this before, is that at age 58, I was very, very concerned that I didn’t have the tech knowledge. I quickly disabused myself of that by looking at what the tech platforms are with physical goods eCommerce, specifically drop shipping. I was able to get over that. It’s pretty obvious that if you’re going to need technical knowledge, you’re going to have to either be able to do it yourself or you’re going to have to be able to hire it out effectively. That’s a pretty delicate balance. The next level up would be the required level of customer supports. What can you tell if you look at a business model, there are some that require more than others? Is that something you can tell just by knowing the business model itself? Yeah, I think one of my early fears was tackling customer support. Who wants to deal with irate customers? No one. Being in a service business in my day job, really websites only exist to provide people with valuable information, upon which they can take an action and receive some kind of a benefit or an outcome. For people that are willing to wait into customer service, we found it to be something that is really a strong suit for us. I think a lot of people shy away from customer service because it’s something they just don’t want to deal with. They leave a fair amount of margin on the table when it’s actually something that’s solvable. There a couple of extremes. One extreme would be to be selling something on the Amazon platform where they take care of everything, or an automated, let’s say, an info product strategy where you click on the link and it’s immediately delivered to you. On the other end of the extreme, which I think is probably underappreciated by people, is software-as-a-service has an incredibly high requirement for knowledgeable tech savvy, knowledgeable customer support. A lot of software-as-a-service businesses require a Zen desk approach where you open up a support ticket and somebody has to literally help somebody access a sophisticated product. We believe that high ticket drop shipping is something where customer service is very easily implementable using standard operating procedures, processes, software. I would probably put that in the middle of the customer service range in terms of difficulty. On the one end, the high end would be something that require an enormous amount of technical knowledge by your customer service people. On the other end, almost zero, which would be where you see they’re automated or Amazon does it for you. Out of seven levels, we’re at the fourth level. This is dead in the middle of the pyramid. That row is called ease of scalability. Obviously, we’re looking for a business that will scale easily and quickly. What did you think about this? Why is scalability right in the middle of your pyramid? I think of this, and I have mixed feelings because I don’t want to make judgments for other people because I think in some ways, some people are looking for something that they want to be intimately involved in. It’s an excellent strategy if you’re of the mind that you want to buy a job. You can run a website by yourself if that’s what you so desire. It was not my desire to do that. It was not our desire to do that. We were looking to be able to scale the business. We think that tackling difficult problems and handling those problems very elegantly is a way that we can add value and we can garner more profitability than people that are unwilling to do that. The people that are unwilling to do that farm things out to Amazon, and they don’t tackle it themselves, or they solve it by making it an automated process, which is the holy grail if that’s possible. In some business models, making it entirely automated is not really an option. The question is, is this something … This is tough. If you want to solve it, we think it’s very solvable. I think for a career professional, someone who’s worked in a team environment or led a team and been involved with colleagues and people that are down a couple of levels in the organization, I think this is right up their alley to be able to solve. I think it’s something that is, at least I think for the demographic that’s listening to this, don’t look past this. You can add a lot of value in a web-based business by tackling this problem. This is really interesting. The last three levels that we talked about, special knowledge, customer support and scalability, all three of those are referring to how much time do you want to spend on this website basically. Right? Interesting. Now we’re in the top third of the pyramid, and we get into this issue, we get into the money round. Are there any dollar margins that you’re thinking people should be looking for or avoiding? Is that the question we’re asking here? Yeah. You avoid low dollar margins, and you go to high dollar margins. The question is how much do you want to be able to earn for on a transaction? There’s a couple of reasons to look at this. Number one, I think it’s an excellent gauge of the value that you’re bringing to the transaction. Something that’s a low margin is much more of a commodity almost by definition than something that has a high dollar margin. From a practical standpoint, Ryan, and I didn’t appreciate this, and it cost me dearly early in my career, is that you actually pay Google dollars and not percentages. If you don’t earn high dollar margins and you earn high percentage margins, Google is still going to charge you dollars. In order to afford paid traffic, and there are only two sources of traffic, there’s organic and there’s paid, in order to afford it, you’ve got to have decent dollar margins, unless you’re going to go to a platform that drives an abundance of traffic, and that has its own risks also. Dollar margins, I think that they demonstrate the amount of value that you’re bringing to a transaction. We’re highly addicted to thinking about the world from that Lens. Above that level is the amount of traffic needed. You were just mentioning traffic. Are dollar margins connected to traffic? It’s very interesting. A model like an AdSense model requires an enormous amount of traffic and has very low margins per click. You use search engine optimization. You don’t have the ability to use paid traffic. When you get to a website, what they’re trying to do is get you to click on a Google placed ad. That’s on one end of the spectrum a strategy that relies solely on SEO. When I think of traffic, Ryan, I want to have every weapon available that I can, and with high dollar margins, I can afford paid traffic. With a strategy that’s focused on driving high amount of value, almost by definition, I’m going to be selling a smaller number of things that have those high dollar margins, which is going to allow me to focus my SEO on that offer. There are business models, which we’ll talk about in the next episode that’s clearly relevant, but you want to be able to afford traffic and be able to generate traffic as efficiently as possible. Just to go back to the original example, AdSense requires an enormous amount of traffic, and the clicks pay horribly small amounts. Whereas, I know people in the high ticket drop shipping world that live quite a nice life with only 150 to 200 visitors per day coming to their websites. Big margins. Yeah, right. We’ve made it to the top of the pyramid, and we’re looking at resale value. Is this a common practice that people, they buy websites and then are people always looking to resell the website or not always? I think that one of the things that when you get initially lost on the Internet, there are a lot of strategies that are touted that generate income but they are not really businesses. What I tried to capture in this for people is the notion that that unless you have a business, you don’t have resale value. I’ll give you just a couple of of off the top of my mind examples of this. One are the people that have Amazon wholesale businesses. This is where you go out and seek to list on Amazon someone else’s products competing against other people that are listing it. At any given day, that supplier can say, “Look, we’re taking it in-house or we’re going to eliminate everybody except Joe and he’s going to be our guy.” It’s really not a business. Those accounts open and close too quickly that no one will pay for those businesses. Another one are, we see these all the time in our Facebook news feeds, these are one product, generally cheaper Chinese source goods that are hot at the time. This is the classic fidget spinner or it’s one product Facebook opportunity, and that’s just not a business. While I’m thinking about it, I met an incredibly good guy and who was at the last Empire Flippers Retreat. When I asked him what he does and what he did, and he said, “I’m really not a business owner like you guys. I drive traffic to affiliate offers, but it’s incredibly idiosyncratic. No one else can replicate what I do. I’m here to learn about the businesses that are out there because I want to buy a business.” There are people that have innate ability to do something like that, but they can’t sell it because it’s too idiosyncratic. The idea of resale value is if you’re going to spend your time, you want to build something and have it be able to garner you some terminal value. Don’t be blinded by the fact that you can make money if you’re not going to build value over a longer period of time. Great. As we wrap up and as we just look across this whole pyramid, when people go to the link, when they look at this graphic, what’s the main question that people should have in mind as they move through the pyramid and think about how this is going to help them in their investment? Well, I’ll steal from the ray Dalio conversation the other day, which was a couple of hours long and we’ve only taken probably 20 minutes to talk about this, but everything that we mentioned begs another layer of questions. This is just a primer. As we get into our next session where we’re going to talk about specific business models, you can see that every … One of these pieces of the framework will then highlight another another topic or two that you’re going to have to cover to get comfortable. This is a beginning framework. It’s something clearly I wish I would’ve had a structure around when I first started looking, so I hope people find it to be helpful. Great. Well, Ian, this was really informative and really helpful and can’t wait for next time. We’re actually going to dive into some actual business models using this pyramid. Thanks, Ryan. I hope people will go to the website, and would please solicit any feedback anyone has that says you’re a wet. You didn’t think about this or what about that? I’d love to come back to in six months and say we’ve gotten an enormous amount of feedback and I want to change my mind. Sometimes you spend a lot of time and you head on this and maybe I’ve forgotten what I hadn’t considered or maybe someone has a different opinion. I look forward to getting the feedback. All right, great. Well, we’ll see you next weekend. Thanks. All right, folks. There you have it. That wraps up my conversation with Ian Bond of Professional Website Investors. He shared a ton of valuable insights and advice today on seven ways to evaluate online businesses. We also shared some tools and resources, which will all be linked up in the show notes at professionalwebsiteinvestors.com. I hope you enjoyed our conversation. Please consider subscribing, sharing with a friend or leaving us a review in your favorite podcast directory. Until next time, best of luck in all that you do, and we look forward to seeing you on the next episode of the Professional Website Investor Podcast.